Their enviable hilltop locations with panoramic long distance views have attracted many different settlers throughout the centuries. Romans, Visigoths, Jews, Muslims and Christians built castles, houses, temples, roads and mills amongst many other constructions in these villages. Nowadays, the “pueblos blancos” can tell us a lot about the culture and customs of their previous and present settlers whilst we explore their beautiful streets and contemplate their stunning views. 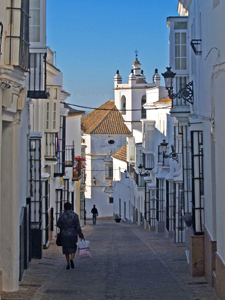 This tour will take us to the villages of Medina Sidonia and Arcos de la Frontera. We will start our journey driving first to Medina Sidonia, also known as “The Balcony of Cádiz” for its impressive views over the whole province. Nowadays famous for its gastronomy and delicious homemade sweets, Medina Sidonia was an extremely important city during Roman times and the capital of one of the independent kingdoms that formed in Muslim Andalusia. We will see some incredibly preserved evidence of these two cultures whilst we explore its beautiful streets. We will have lunch in a great local restaurant to later drive to Arcos de la Frontera or simply Arcos. Once on the frontier between two kingdoms (one Muslim and one Christian), the quaint whitewashed town of Arcos de la Frontera still keeps proof of this in its name. Arcos is a delightful labyrinth of narrow streets spotted with palatial houses, monumental churches and a prominent castle. Getting lost in the winding streets of its old town is a real pleasure that can lead to discover beautiful hidden corners. In Arcos we will also see breathtaking views of the Gudalete valley and visit a private residence to see the inner side of the old town’s traditional architecture. We will later stop for coffee to relive the memories of the day and finally we will drive back to your accommodation. This day trip is ideal for people staying in other locations in Andalusia wishing to visit these two white villages in one day. It includes private transportation in a modern and comfortable vehicle with A/C to and from your accommodation. Your personal guide and driver will pick you up in the morning and will drive you back in the late afternoon after spending a great day together being inspired by Medina Sidonia and Arcos. Group size: minimum 1 person, maximum 8 people. Pick-up point: your hotel in the Jerez – Seville area (contact us for other pick-up points). Prices: start at 88 Euros per person (incl. VAT) for a group of 8 people. Includes: private guide and driver throughout the day and all entrances. Payment: Credit Card, PayPal or Bank Transfer.